We’re having a good, fairly consistent springer season on the Cowlitz River. It’s not as good as last year, but I’m still averaging four to seven bites a day. May and early June traditionally marks the peak of our run. It’s going to be strong for the next few weeks. Decent fishing will persist through mid June. This season good fishing has been framed by stability. This is a dam-controlled river. When levels aren’t being tinkered with we’ll get lots of bites. However, when they raise and drop the water the bite is tough. Meanwhile, as soon as they stabilize it the bite gets good again. It doesn’t matter if they raise or lower water, it hurts the bite. Fortunately, stability brings action. 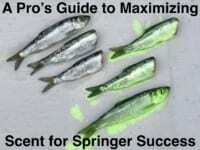 While many anglers focus on one method to catch springers I do the opposite. I’m running three or four different baits at once. If I have five rods out all five could have different bait on them. It’s important to let the fish decide what they want. As the day goes on I’ll switch over to what they are biting. I’m not relying on one bait. I give them it all to the springers and let them tell me what they want. And, what they want varies throughout the day. I’m doing my herring different this year. Unlike many, I’m taking them straight out of the package. Then, I’m throwing salt in them, squirting Fire Dye in them and being done. It’s basically fresh bait. It’s fresh/frozen, but fresh. I’m doing better with that then brining. Chartreuse Fire Dye has been my best, but Blue Fire Dye is a close second. Chartreuse is best in the morning and as the sun comes out I’ll switch to blue. If the first rod has a Fire Dye herring the second rod is going to have a plug with scented bait. I’m taking canned tuna and adding Red Fire Cure to it. I’ll add about a tablespoon of a can of tuna and then add Fire Power for increased scent. Then I mix it up and wrap it on my Mag Lip 3.5. Of course, I’m also running straight eggs. 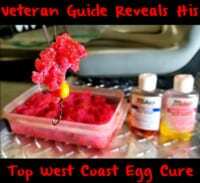 I’m using a mix of Pink and Red Fire Cure. I’ll use three-quarters pink to a quarter red. I’m running them on a diver with a sand shrimp or a piece of tuna tipped on it. Cured roe is standard in this system. I’m also using brined prawns. The recipe is simple, but going through the process is imperative. I start with a cup of sea salt, half a cup of raw sugar, a tablespoon of sodium sulfite and then drop the prawns into a quart size jar. Next, I’ll fill the jar with Pink Fire Brine and a tablespoon Pink Fire Dye. At this point I’ll add scent. Sometimes it’s anise, Fire Power or garlic. Then I’ll let the prawns soak in the jar for three days. The important thing is experiment with different scents daily. What they want changes day to day. I’ll have a few jars with a few different scents in them on the boat at all times. The biggest thing is I never tell the fish what they are going to bite. I let them tell me what they want. Editor’s Note: Bob Kratzer operates Angler’s Guide Service. For more information on his Cowlitz River springer trips please visit https://www.facebook.com/pages/Anglers-Guide-Service.